What do you have so much of that you almost don't know where to put it all? There's ticket-related data and contact data. There's data about response times and paid invoices and click-through rates. It's all data, all the time. But what if you had a way to focus in on the data and metrics that matter most to your business? What if you could have it organized and available in one central location? 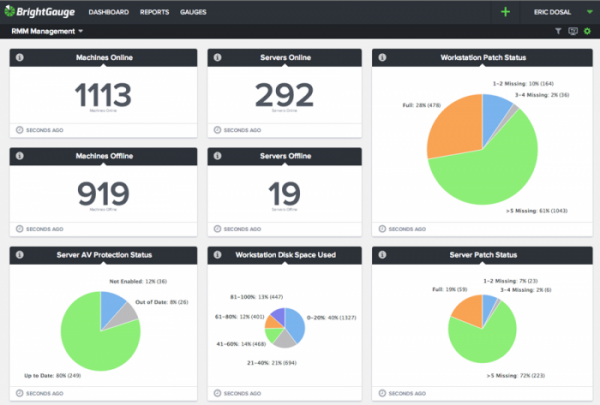 BrightGauge is a centralized business intelligence and custom reporting platform for IT service providers. Not only do they get all your data from across PSA, RMM, and Finance software(s) into one place, they help you organize, manage, and report on it in a way that makes sense. And they do it using this magical thing called a Gauge. "The modules or widgets that provide visual representations of your data using [the] fields queried by datasets." These fields can be anything from title, date opened, and date closed to response time and resolution time. And the visual representation comes in the form of charts, numbers, lists, and/or tables. Pretty handy, huh? Then you have customizable Dashboards and Reports. These let you properly group, display, and share all that great data. Dashboards are like big story boards where you can pin your individual Gauges. Reports give you a secure way to capture snapshots of your metrics, filter results, and, of course, share with your team members and/or clients. BrightGauge integrates with SmileBack. You can import your entire CSAT dataset, then design your own Gauges, Dashboards, and Reports specifically focused on client satisfaction. From there, the sky's the limit. Create a Company Watch List: Keep your eye trained on those companies with low CSAT scores who are the most at-risk, for example. Automate a Client-Facing Report for QBRs: Give your clients personalized insights/visibility into your service delivery. Not only can you brand it specifically for them, you can also set it up to be automatically created and electronically delivered as a PDF with a link to a live, in-browser report. Design Live-Updating Dashboards: With live-updating dashboards that you can keep on display or easily accessible, you and your team can maintain a constant overview of the metrics that matter most. So what are you waiting for? That data is just going to keep coming. Go check out BrightGauge to get it all in one place, where you can actually see and report on it.